Danville is the home of one of America’s largest rural medical centers, and for nearly two decades I worked there with sick children, some so ill they couldn’t walk from one chair to another across the livingroom floor. 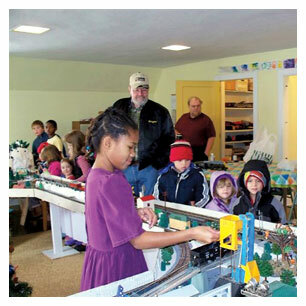 I saw, in the national railroading magazine Classic Toy Trains, a notice from the Michigan-based Lawrence Scripps Wilkinson Foundation. 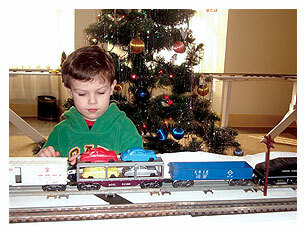 The foundation’s website at wilkinsonfoundation.com pictures and describes famous model trains it has collected as part of its research into American railroading. The foundation owns 275 famous trains, representing models of real trains that were glamorous flagships of the great American railway systems. The note I saw offered to donate free trains to the operators of museums, restored railroad depots, or 501(C)3 charitable organizations. We applied for a passenger train, and one November afternoon a delivery truck rolled up to our door with a brand new seven-car K-Line Broadway Limited. This is something new so, to protect it, we’ve installed a speed regulator on the track. Copyright 2011 Wheelchair Engineers, all rights reserved.